Barack Obama’s last first-term press conference: The president spoke of Republicans as though they have no leverage in debt ceiling negotitations. 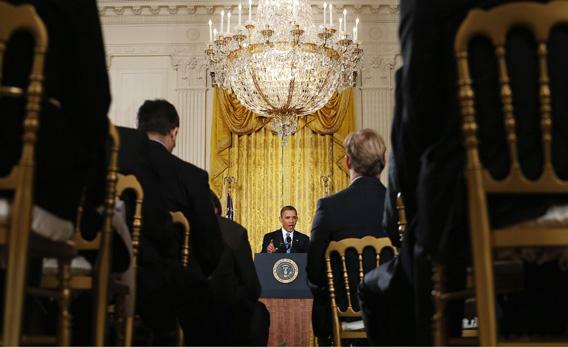 President Obama uses his final first-term press conference to browbeat the new Congress. President Obama holds a news conference in the White House on Monday in Washington, DC. At the tail end of Monday’s press conference, the last one of Barack Obama’s first term, a reporter figured out how to trip up the president. Jackie Calmes of the New York Times followed up a string of questions about the debt limit by asking whether the president needed to do more socializing. This theme has weighed heavily on the minds of Washington reporters who study Robert Caro’s LBJ bios and notice when back-slap-happy Joe Biden swoops in and conjures a fiscal deal. Obama couldn’t have earned less sympathy from Republicans if he’d snuffed out cigarettes in their lattes. To them, Crist is a callow greasy-pole climber who enabled Barack Obama’s $873 billion stimulus spending. None of them regret giving Florida’s U.S. Senate seat to Marco Rubio instead of Crist. This idea that Republicans opposed Crist because he hugged Obama was offensive, trite, and wrong. “They were upset with him because he hugged the President’s failed [stimulus],” says Club for Growth spokesman Barney Keller. He knows. Obama wrapped up his first term by portraying Republicans as unreliable and craven hostage-takers. He referred to their demands, for spending cuts in proportion to any debt limit increase, as “ransom.” To talk in those terms, he said, would be a “negotiation with a gun at the head of the American people.” If Congress wanted to “give me the authority so that they don’t have to take these tough votes,” it would spare itself some war wounds. This wasn’t entirely fair. In the debt limit negotiations of 2011, and in the excruciating “fiscal cliff” sequel last month, the White House floated a number of entitlement cuts that would have wrought real political pain on Democrats. The sun probably hasn’t set on ideas like chained CPI and adjustments to the Medicare or Social Security eligibility ages. At the time, Obama—gun at his temple—had embraced the idea that a debt limit crisis was a way to coax reform out of Washington. “All of us agree that we should use this opportunity to do something meaningful on debt and deficits,” he said in a July 2011 press conference. “If not now, when?” The new answer is sometime later, maybe. Can the president get away with more delay? That depends on whether he can separate the popularity of the GOP’s debt ceiling stance from the widespread public loathing of its House majority. (Obama referred repeatedly to “this Congress,” lumping together Boehner’s House with the minority filibuster-ers of the Senate.) After the “cliff” deal was reached, Boehner revealed a Republican poll on the concept of pairing the debt ceiling vote with “spending cuts and reforms.” Seventy-two percent of respondents said that they wanted the debt vote tied to something. Obama’s task: Tell the public that it’s been misinformed, and that it can’t trust the GOP. The repetitive press conference questions about the debt ceiling teed up Obama to explain that “the debt ceiling is not a question of authorizing more spending,” and “raising the debt ceiling does not authorize more spending,” and so on. House Republicans were spending money and blaming him for it. The nerve! “Some of the same folks who say, we got to cut spending or complain that, you know, government jobs don’t do anything, when it comes to that defense contractor in their district, they think, wow, this is—this is a pretty important part of the economy in my district and we shouldn’t stop spending on that; let’s just make sure we’re not spending on those other folks.” His term began with Republicans warning that stimulus spending would never grow the economy; he was ending it by calling them hypocrites. Years ago, an Obama-watcher might have asked about the downside of this harsh tone. At an early 2009 meeting on the stimulus, Republicans complained that Obama was going to give a tax credit to people who didn’t pay net taxes. “I won,” said the new president. The comment zipped out of the room and into Republican lore. But since then, Democrats have become increasingly convinced that nothing mollifies Republicans. A trove of political science research (highlighted by Ezra Klein last year) suggests that the party out of power is inclined to oppose anything that the president prioritizes. Democrats had no particular stance on Mars exploration funding, until George W. Bush called for it. That turned them into hard “no” votes. Obama has faced hotter opposition than that, and on higher-stakes issues. As he told Univision in a September 2012 interview, he learned that “you can’t change Washington from the inside,” and that he’d start “a much more constant conversation with the American people” to push past congressional opposition. Republicans, who by that point were calling every Obama quote a gaffe, claimed that the president had undermined the meaning of his presidency. But they probably understand him now.